One of the best times of the year to spot one of our native breeds. In my view, an unkind name, particularly when the UK has only two native lizard species (and in fact only six reptile species in total). Whether viewed as common or a gem, May and the warmer months are a great time to look for this species (Lacerta vivipara). One of the cheapest ways to check an area for lizards is to leave a metal tray or tin in a warm area, as, being cold-blooded, lizards will often use these to bask on and store energy. They may even use a tray to shelter under in cool weather, or at night. The common lizard is between 10-15cm long (including tail) and olive green in colour, with yellow, brown or black markings. They usually inhabit grassland, hedgerows and sand dunes, feeding on insects and spiders, which they shake to stun, and swallow whole. A female common lizard will store fertilised eggs in her body until almost fully developed, for protection and warmth. The young are released in an egg sac which will either break during birth, or a few seconds later. This behaviour has led to the species also being known as the Viviparous Lizard. 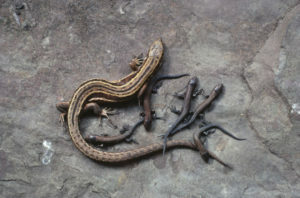 During March lizards emerge from hibernation, and mating season is between April and May, with young appearing in July. Each female typically produces between three and ten young.